Success stories using our System for Success. Every project that comes through the doors of Action Floor Systems receives our utmost attention. And, we’re proud of each and every one. Our System for Success focuses our experience, dedication, and innovation from beginning to end to meet that particular customer’s flooring needs. Each project is unique and requires a fresh approach to determine which Action Floor System is best for the performance needs, timing, and budget. The featured projects below contain the problem, the process, and the results along with input from those involved and the ability to download a project overview sheet. Click on a project of interest to reveal complete details. Discover how an Action Floors dealer helped a California high school find an efficient way to update an old synthetic sports floor to a high-quality hardwood maple court. 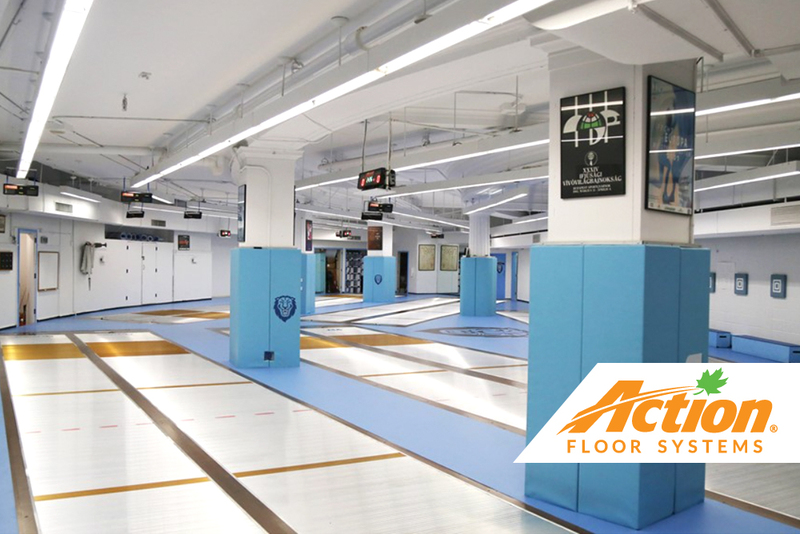 Radical Fencing, a creator of portable resilient floating floor systems, and Action Floors helped provide a new floor for the Columbia University fencing team. Find out how our new pad and pour sports floor system, Action Synchro, gave an outdated K-12 gymnasium a much-needed update with an eye-catching finishing touch!